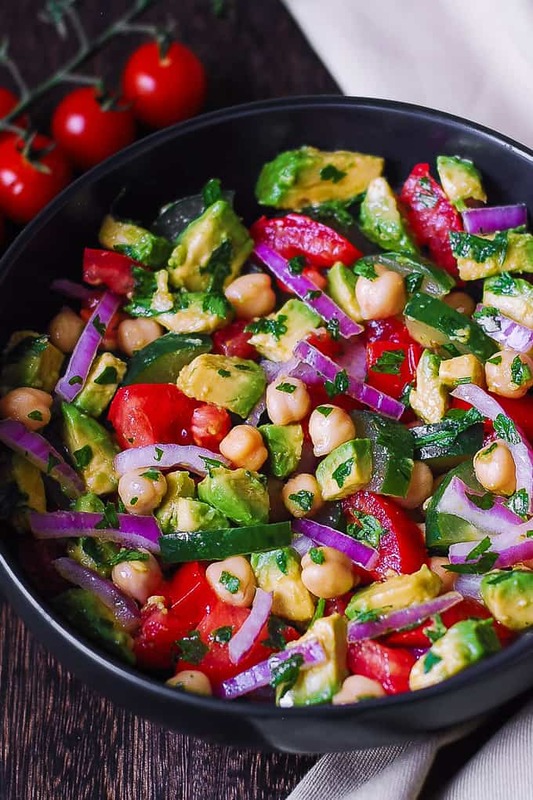 This healthy Mediterranean Chickpea Salad with Avocado, Tomato, Cucumber is vegan and gluten-free! Low in fat and high in protein. Quick and easy to make. Delicious Spring/Summer chickpea salad that uses lots of fresh vegetables. This beautiful, vibrant chickpea salad has Greek and Mediterranean influences. It’s made with fresh vegetables. The salad dressing is very simple: olive oil combined with lemon juice. The chickpeas (same thing as garbanzo beans) provide protein to this recipe. It’s gluten-free, vegan, low in fat and healthy. The simplest of recipes are the best! It takes only 20 minutes to make it. 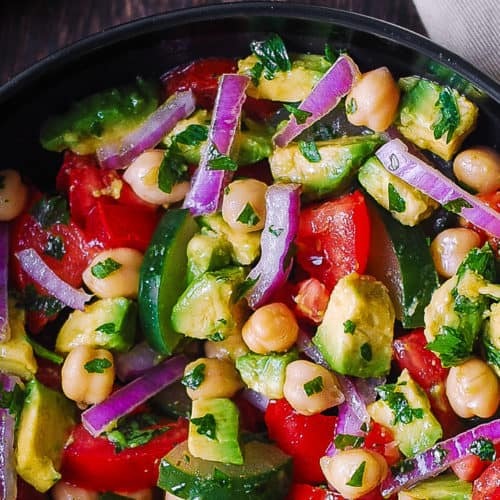 This vegetarian chickpea salad reminds me of my other favorite: tomato cucumber avocado salad. Both salads are packed with fresh veggies and healthy ingredients. If you want to pair it with a delicious gluten-free main course, try my chicken with sun-dried tomatoes. If you crave a meal with more carbs, you will be impressed with these easy Italian ravioli. But, what’s amazing about this meatless chickpea salad is that you don’t even need a main course. 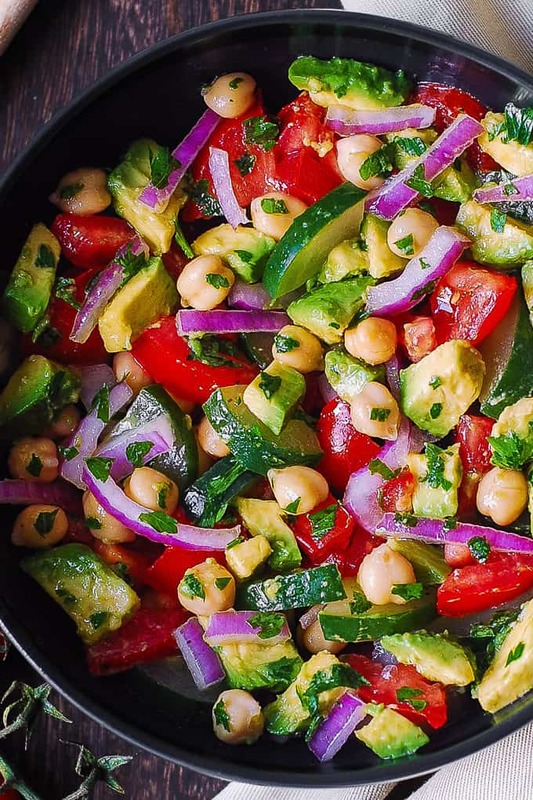 This salad will keep you full thanks to the protein in chickpeas. It’s a perfect Spring/Summer recipe. 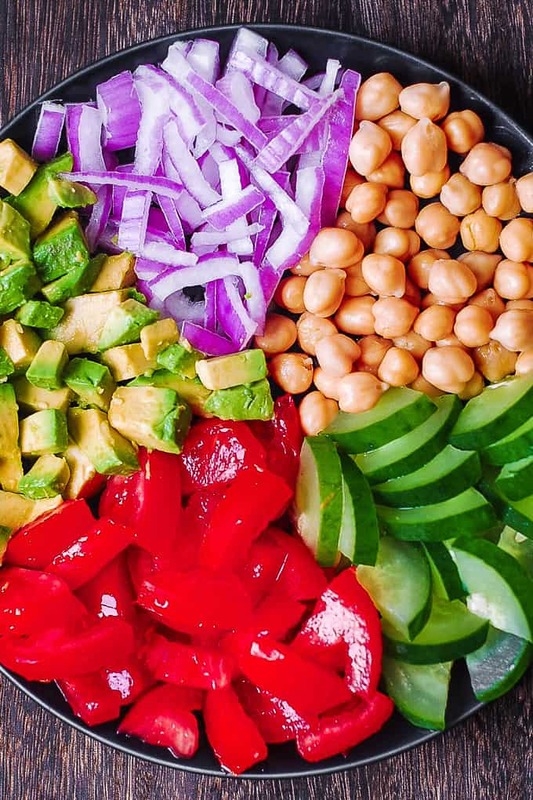 Take a look at the chickpea salad: so vibrant and colorful! A great way to enjoy lots of healthy vegetables. Perfect for picnics, potlucks, and barbecues. It stores well, refrigerated, up to 3 days. Make this chickpea salad spicy by adding red pepper flakes and/or minced garlic! Use any kind of fresh tomatoes. Roma tomatoes, cherry tomatoes, or grape tomatoes will all work! Use fresh herbs of your choice. Basil, parsley, cilantro. Don’t have red onions? Use chopped green onions. Or yellow/white onions. You can even add a small amount of minced garlic! Add olives or capers. They add even more Mediterranean touch to the chickpea salad. Make the chickpea salad spicy by adding red pepper flakes or a touch of Cayenne pepper! The simple dressing is made with olive oil and lemon juice tossed with chopped fresh herbs, salt, and pepper! In a medium bowl, stir together olive oil, lemon juice, chopped fresh parsley, and chopped fresh basil. In a large bowl combine diced tomatoes, diced cucumber, sliced red onions, and drained chickpeas. Add diced avocado. In a medium bowl, prepare a simple salad dressing. Combine olive oil with lemon juice, and chopped fresh herbs (basil and parsley). Pour the dressing over the salad. Toss gently. Season with salt and pepper. 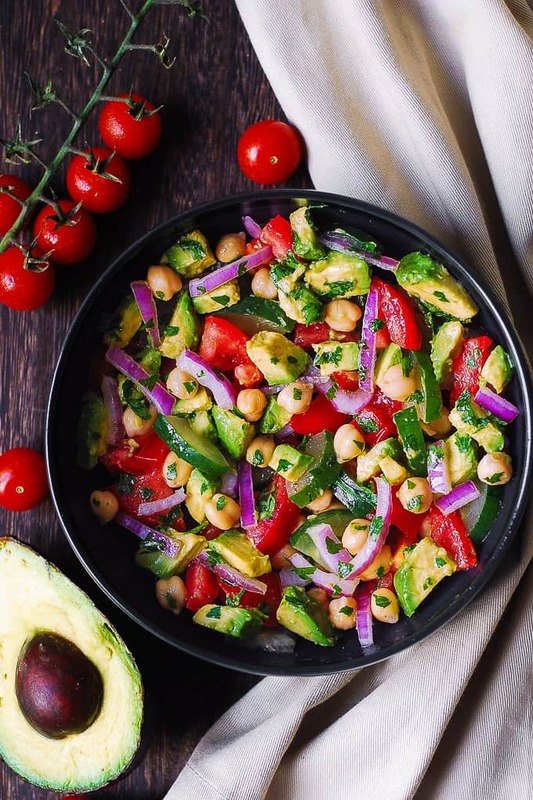 Simple Chickpea Salad with Avocado, Tomato, and Cucumber. This healthy Mediterranean salad is packed with protein, low in fat, is vegan and gluten-free. 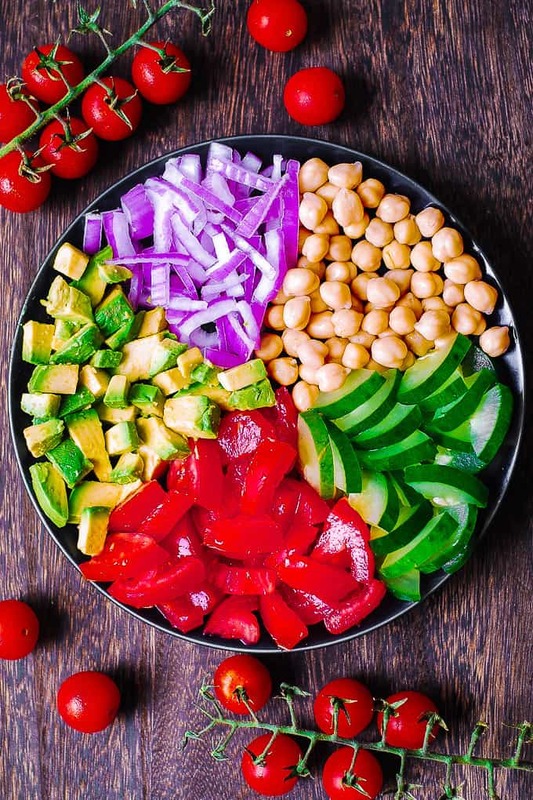 Colorful, vibrant, with lots of veggies! 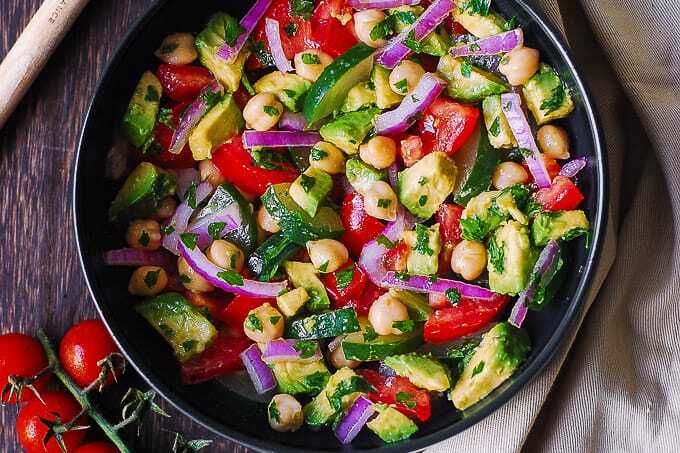 In a large bowl combine salad ingredients: diced avocado, diced tomatoes, diced cucumber, sliced red onions, and drained chickpeas. In a medium bowl, combine salad dressing ingredients: olive oil, lemon juice, chopped fresh parsley, and basil. Stir to combine. Pour the dressing over the salad. Toss to combine. Season with salt and pepper. Is the calories for the entire salad? No, the calories are per one serving. There are 4 servings in this recipe. Served with grilled chicken. Perfect!